The thought of losing control of an empire that was once yours to manipulate anyhow you want is obviously so terrifying and can lead people to act in such animalistic and unbelievable manner. Alas, empires rise and fall, but the people; the indigenous people remain. For 50 years, the Arewa had dominated the political, security and economic landscapes of this geographical expression called Nigeria. They had tenaciously held on to the spoils of war ensuring that the late Sardauna of Sokoto’s dream of Nigeria being an estate of Usman Danfodio; where the South as a conquered territory will never have control over their destiny. We may have lost the battle in 1970, but are we conquered? The fact that we fell does not mean we must remain down for life. Biafrans are not conquerors neither are they conquered people, the Igbo landing saga is a testament to that. The infamous Kaduna declaration obviously intended to intimidate and blackmail the Biafran uprising in the East has failed in its objective because the so-called Biafrans denouncing Biafra are not the ones that has made Biafra a world renowned name, they are not the ones holding rallies in all most all cities of the world, they are not the ones funding and running the affair of the largest freedom fighting movement in black Africa today. I have to think aloud because I do not understand how a handful of old men dressed in traditional attire living in Gusau, Kaduna, and Kano, declaring for one Nigeria in state sponsored Press conferences, satisfies the Arewa Youths. I also wonder what the Hausa/Fulani really want, the denouncement of ‘hate speeches’ or denouncement of the right to self-determination? If it is the later, then it is unfortunate because we have crossed the Rubicon already, and if it is the former, they should please remove the log of wood in their eyes first. When the Hindustans split into the Muslim Pakistans and Hindu Indians, Pakistans were very hostile to Hindu immigrants, unlike India that had an open door policy. Today, the difference between both countries is clear for all to see. The Arewa people have the right as a people to deny foreigners visa to their Republic but not before the split, if they really clamour for genuine separation of the country, they should join in the call for referendum without the lustful gaze at Biafran properties in their domain nor trying to activate the ‘vampire mode’ of their blood thirsty genocidal mob. How can you be calling for Easterners to leave the north, and on the other hand, calling for Nnamdi Kanu's arrest citing threat to National unity? How can you be writing the UN to aid in a referendum you have already concluded would not favour Biafra, and yet you are threatening their lives and properties should they remain in your part of the contraption after 1st October, even before the referendum? What really goes on in the cerebral hemispheres of these people? It is no longer news that there has been a very inciting audio song circulating in some parts of the north calling for the mass killing of Biafrans. The world must be put on alert because if any Easterner in the north is killed due to the hate messages of the Arewa youths, Yerima Shettima and his co-travelers must be held responsible. Is it not ironic that Nnamdi Kanu they accuse of being the mastermind of hate speeches and Biafrans, the authors of hate, have not found it necessary to kill any northerner. Even during those peaceful protests when innocent Biafrans were mulled down by these Arewa dominated military apparatus, even when Biafran youth corpers were massacred in this same North following the abysmal failure of Buhari at the polls in 2011, not a northern soul was killed in Biafra land. Now they have the effrontery to compose songs and even generate rhetorics on social media, intended to threaten Biafrans, capable of inciting the ‘blood thirsty mob’ domiciled in the core North against Biafrans. What do they want? Perpetual servitude? Of course, that's not possible. Biafrans to turn against or ignore Nnamdi Kanu? Unimaginable! Nnamdi Kanu is a human with his imperfections as a man but the dream for which multitudes follow him is a perfect one: a country of Africans by Africans and for Africans and lovers of freedom. The Nnamdi Kanu that came out of prison after two years of Kangaroo trial on phantom charges, has been calling for a referendum not war, civil disobedience not chaos. 50 years have come and gone, but it seems we are at the onset of another Odysseus, the actors might be different but the drama is familiar. Emir Sanusi once said that the core north is held back in the 13th-century mindset, hence their monopoly of animalistic carnage. When people raise concerns over the excesses of the core north, it's not due to fear, but because our civilizations are centuries apart and the kind of savagery exhibited at times by the Hausa/Fulanis is not in tandem with the 21st-century civilization. We are not calling for war, rather, we are simply demanding for our right to leave the union in peace, because no matter what, we will still all be members of the ECOWAS, AU and the bigger African continent, but we MUST cease to be tenants of the Usman Dan Fodio estate. Right in my village UMUNNA meeting we have agreed that nobody will vote after all we never ever benefits from government and whether you vote or not they will still rig themselves to power. Again the vampire Hausa/fulani controlled security agencies that have kept Biafra land under siege can even kill you on election day and nothing will happen. Let only their paid thugs and family members vote for them. Biafra or death is our chosen path. 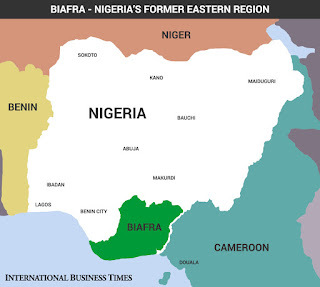 Each time I see the size of Biafra nation in Nigerian map, it irritates me because of the deception of that map. Off-course Biafra republic is larger and bigger than that. This is the same tactics with the census. 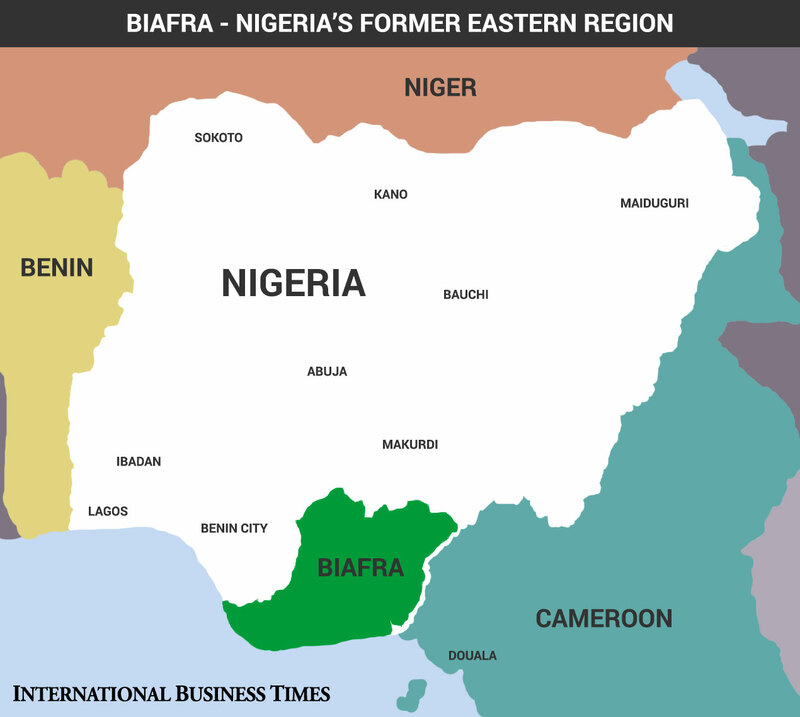 The Nigerian map must be re-drawn to reflect the actual size of Biafra Republic. It does not make sense that the size of any State in the north is larger than the entire SE and comparable to the size of Biafra nation. Nigeria is one great deception, corrupt, violent, and lawless country. The size of the map does not matter one bit. It is the character and the intellect of the people that matters in this day and age.